Up your experience with Hometown Rising Top Shelf Suites! Our most premium option tailored for business or pleasure includes all GA, VIP, and Top Shelf VIP perks PLUS a private suite for up to 12 guests, comfortable seating with elevated view of main stages; Dedicated in-suite fridge stocked with select spirits, wine, beer and non-alcoholic options PLUS access to the top deck open bar. Coming to Hometown Rising with friends? 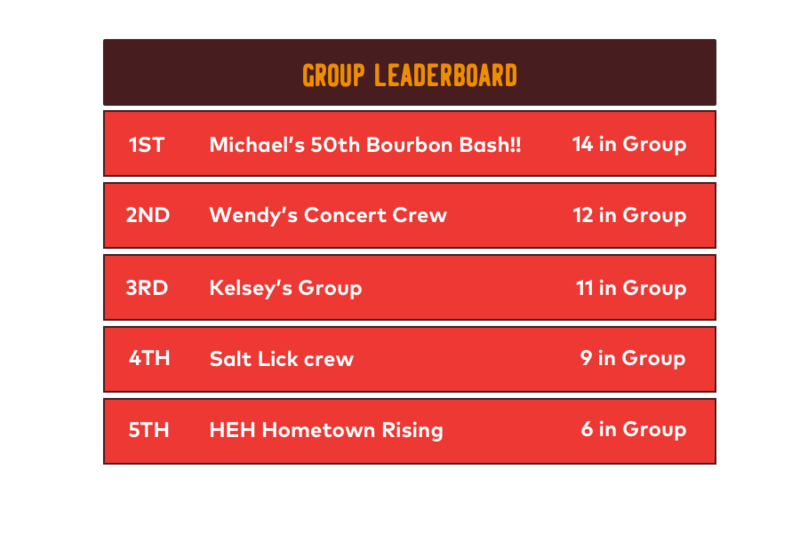 Start your group to win prizes like a group photoshoot, specialty merch and more. Purchase your ticket, name your group and invite your friends! The fun doesn’t have to end at Hometown Rising! Why not come back for more at Bourbon & Beyond and Louder Than Life? Get your fill of music at all three Louisville shows for a discounted rate. We’ve made it easy to try them all with the Trifesta Pass. Each pass allows GA entry to all three shows. When you receive your wristband, please read all instructions on how to activate & wear your wristband to ensure quick and easy entry into the festival each day. Layaway options are available upon checkout. View our ticket options HERE. – Hometown Rising is an all ages event. Patrons 5 and older require a ticket for entry. As part of this innovative partnership and Kroger’s commitment to zero hunger | zero waste, 25 cents will be donated directly to dare to care food bank from every ticket sold. Dare to care food bank works to ensure that no one in our community lacks enough food to live an active, healthy lifestyle, and Kroger’s zero hunger | zero waste initiative is their bold plan to end hunger in our communities and eliminate waste in their company by 2025. For more info visit here. – Hometown Rising is an outdoor event and is held rain or shine. – Festival wristbands are not transferrable once applied to a patron’s wrist. – Tickets may not be used for advertising, promotion (including contests and sweepstakes), or other trade purposes without the express written consent of Hometown Rising.